Just finished a 8 night cruise in the Caribbean with Carnival Conquest with my wife and 12 year old daughter.................It was fantastic! We visited Princess Cays, which was a lovely beach paradise. Which was slightly let down by a very slow tender service, which took forever! zzzzzz Grand Turk was next, which we have been to before and loved it! We hired a car, ( they drive on the correct side of the road ! ), which we did last time, to escape the crowds which gather by the cruise terminal, as there is a great beach and Margaretaville where you come off the ship. So we went up to the other end of the Island, seeing plenty of wild donkeys on the way! Where we found a deserted beach with great Conch Shells, which my wife and daughter liked. Then off we went to Governors Beach, which is my favourite beach in the Caribbean! Absolutely stunning with Trees for shade, powder sand, clear water and deserted!...There was only ourselves and another family on the whole beach! Also at one end there is an old ship partly sunk near some rocks which makes for good snorkeling. Next was Curacao, which was new for us. We did a little tour from one of the many firms haggling for your Dollars. Which was quite interesting, visiting the Jewish Quarter and the Curacao Liquor Factory......Which was most enjoyable!!! Then dropped in town for a walk over the Pontoon Bridge and a drink and a bite to eat by the water. Then some shopping!............With some good old haggling at Diamonds International! Then our last stop was Aruba........Stunning! Went to Eagle beach which was nice, but busy. Terrific Island and a great port for shopping, which my wife enjoyed more than me! Now for the ship...........Carnival Conquest was a fun and friendly ship! Yes, it can be a bit gaudy with the decor! But it was spotlessly clean. We had a Balcony Cabin, 7422 aft. Which was great, so easy to get to everything. 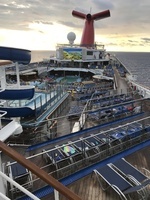 The 3 pools were fine, ( 1 adult only), plus a water slide which my daughter and friends that she made on the ship really enjoyed. Plenty of sun loungers available, even on a sea day. I found a great spot on Deck 12, which was near everything, but still quite peaceful. Yes Carnival is a bit loud, but Matt the Cruise Director was great fun and entertaining! For example at Grand Turk, blurting out Karaoke on the dock by the ship and getting some willing and some less willing participants to join in! The shows were great, especially the 1980&apos;s show. With some great use of giant screens at the back of the stage, which the cast used to great effect, and also treadmills!.... A must see! Other great entertainment were the Girls Trio group of 2 Violinists and a Cello, who were not only stunning to look at, but captivated the whole Atrium when they played. Also the Piano bar was great fun......(sorry I can&apos;t remember his name), especially later on in the evening after he&apos;d a few drinks! Casino was good fun, especially the Poker Table, where I made a good few friends....... And maybe 1 or 2 enemies! (Only Joking) The food was exceptional!......The Buffet restaurant had plenty of variety,( If only they could have English Bacon!!! ), the omelette station was good. Also not forgetting Guys Burgers!! !....Best burgers in the world! We had Anytime Dining, which was good.The food in the MDR was excellent, especially the Port of Call Dishes. For example in Curacao I had a Patty (Hot Cornish Pasty) to start, then Red Snapper on Black Bean Rice....mmmm! On the 2nd evening, which was very busy as it was Elegance Night ( they wear pants(trousers) to Dinner! )we were seated on Kooman, Johnrey andGautam&apos;s section.........Well imagine Chow from the film "The Hangover", that is Kooman!!! What brilliant entertainment and with excellent service! It made Dining even more enjoyable, especially for my daughter who couldn&apos;t stop laughing! Overall, this was an excellent relaxing cruise, especially as there were only us and another couple of Brits on board! Which I like as the Yanks are so friendly and it&apos;s much easier to get a sunbed !!! Conquest lives up to her name! 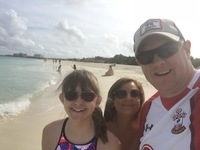 Just finished a 8 night cruise in the Caribbean with Carnival Conquest with my wife and 12 year old daughter.................It was fantastic! Grand Turk was next, which we have been to before and loved it! We hired a car, ( they drive on the correct side of the road ! 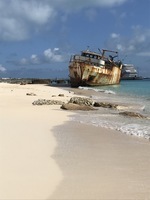 ), which we did last time, to escape the crowds which gather by the cruise terminal, as there is a great beach and Margaretaville where you come off the ship. So we went up to the other end of the Island, seeing plenty of wild donkeys on the way! Where we found a deserted beach with great Conch Shells, which my wife and daughter liked. Then off we went to Governors Beach, which is my favourite beach in the Caribbean! Absolutely stunning with Trees for shade, powder sand, clear water and deserted!...There was only ourselves and another family on the whole beach! Also at one end there is an old ship partly sunk near some rocks which makes for good snorkeling. Next was Curacao, which was new for us. We did a little tour from one of the many firms haggling for your Dollars. Which was quite interesting, visiting the Jewish Quarter and the Curacao Liquor Factory......Which was most enjoyable!!! Then dropped in town for a walk over the Pontoon Bridge and a drink and a bite to eat by the water. Then some shopping!............With some good old haggling at Diamonds International! Then our last stop was Aruba........Stunning! Went to Eagle beach which was nice, but busy. Terrific Island and a great port for shopping, which my wife enjoyed more than me! Now for the ship...........Carnival Conquest was a fun and friendly ship! Yes, it can be a bit gaudy with the decor! But it was spotlessly clean. We had a Balcony Cabin, 7422 aft. Which was great, so easy to get to everything. The 3 pools were fine, ( 1 adult only), plus a water slide which my daughter and friends that she made on the ship really enjoyed. Plenty of sun loungers available, even on a sea day. I found a great spot on Deck 12, which was near everything, but still quite peaceful. Yes Carnival is a bit loud, but Matt the Cruise Director was great fun and entertaining! For example at Grand Turk, blurting out Karaoke on the dock by the ship and getting some willing and some less willing participants to join in! The shows were great, especially the 1980&apos;s show. With some great use of giant screens at the back of the stage, which the cast used to great effect, and also treadmills!.... A must see! Other great entertainment were the Girls Trio group of 2 Violinists and a Cello, who were not only stunning to look at, but captivated the whole Atrium when they played. Also the Piano bar was great fun......(sorry I can&apos;t remember his name), especially later on in the evening after he&apos;d a few drinks! The food was exceptional!......The Buffet restaurant had plenty of variety,( If only they could have English Bacon!!! ), the omelette station was good. Also not forgetting Guys Burgers!! !....Best burgers in the world! We had Anytime Dining, which was good.The food in the MDR was excellent, especially the Port of Call Dishes. For example in Curacao I had a Patty (Hot Cornish Pasty) to start, then Red Snapper on Black Bean Rice....mmmm! On the 2nd evening, which was very busy as it was Elegance Night ( they wear pants(trousers) to Dinner! )we were seated on Kooman, Johnrey andGautam&apos;s section.........Well imagine Chow from the film "The Hangover", that is Kooman!!! What brilliant entertainment and with excellent service! It made Dining even more enjoyable, especially for my daughter who couldn&apos;t stop laughing! Overall, this was an excellent relaxing cruise, especially as there were only us and another couple of Brits on board! Which I like as the Yanks are so friendly and it&apos;s much easier to get a sunbed !!! Great cabin, kept very clean. With great towel animals! Plus the most comfortable bed at sea! Went to the beach.......great day, apart from the sunburn! Great to see the island.........and the Liquor factory!!! We stayed down the road at Hollywood Beach at Margaretaville.........I can highly recommend ! I love Grand Turk! Not only do you drive on the correct side of the road (the left), it is so friendly and so much more than the beach you see when you dock. There is the light house, the wild donkeys and deserted beaches! The best being Governors Beach, which is my favourite beach in the Caribbean!